Thanks to all the wonderful promoters and audience in Japan and Taiwan. Next stop for the Partners tour, UK and Ireland, then Spain, Portugal, Netherlands and Germany. That will be all for this year, but there will be more concerts early next year, which I’ll be announcing most likely in December. 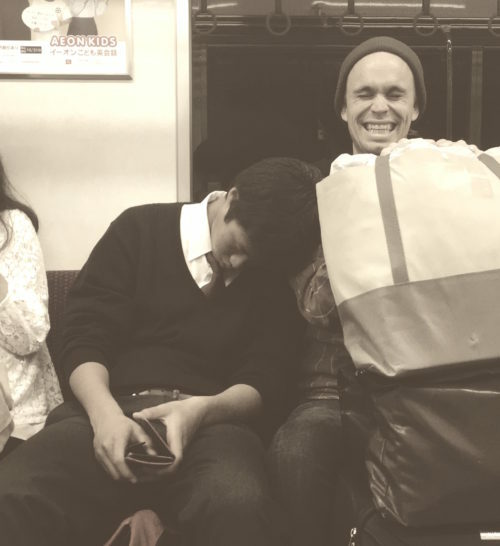 Thanks Shinsaku for taking this picture of a stranger falling asleep on my shoulder on the subway in Tokyo. This entry was posted on Tuesday, October 4th, 2016 at 7:18 am	and is filed under News. You can follow any responses to this entry through the RSS 2.0 feed. You can leave a response, or trackback from your own site.